Overslept, and didn’t arise until 10AM, thus missing the breakfast that came with the room. Damn. 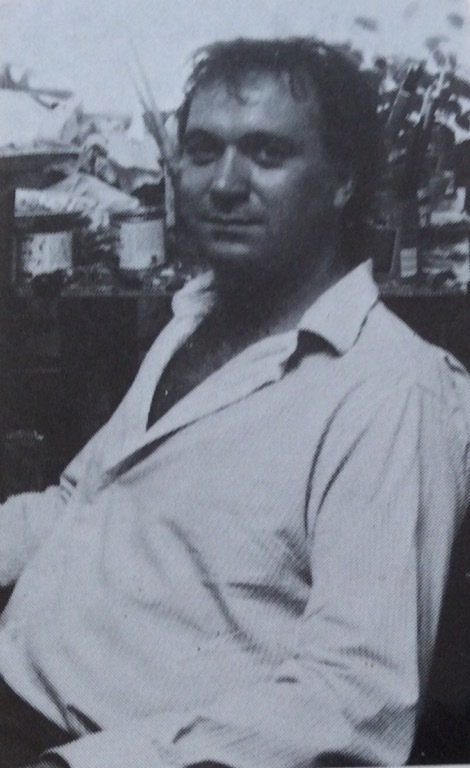 On the last day of our trip to England with our daughters back in 1985, I found myself wandering through an area of art galleries alone. I saw a piece in the window that I liked a lot, so went in and asked the gallery owner whether she had any other paintings by the artist, John Edwards. She did not, but said that he lived not far and they could get other paintings in a couple of days, as they were about to open John’s first one-man show. When I said that that would not do us any good, she picked up the phone, called John and said we could go over to visit him and see his work in his studio/apartment. So, I packed up Carol and the kids and we went to see John, who lived in a converted biscuit factory in Southeast London accessed through an old fashioned freight elevator. We hit it off with John, who is a very engaging and funny fellow, originally from Wales. He showed us a notebook of drawings he did when he was five, and he tries to duplicate some of that childlike quality in his work. Before we left his apartment, we had guaranteed the success of his first show, as we bought five paintings. We’ve stayed in touch with John, off and on, and saw him twice in Chicago, when he was over to show his work. Here is John and two photos of paintings we own by John. 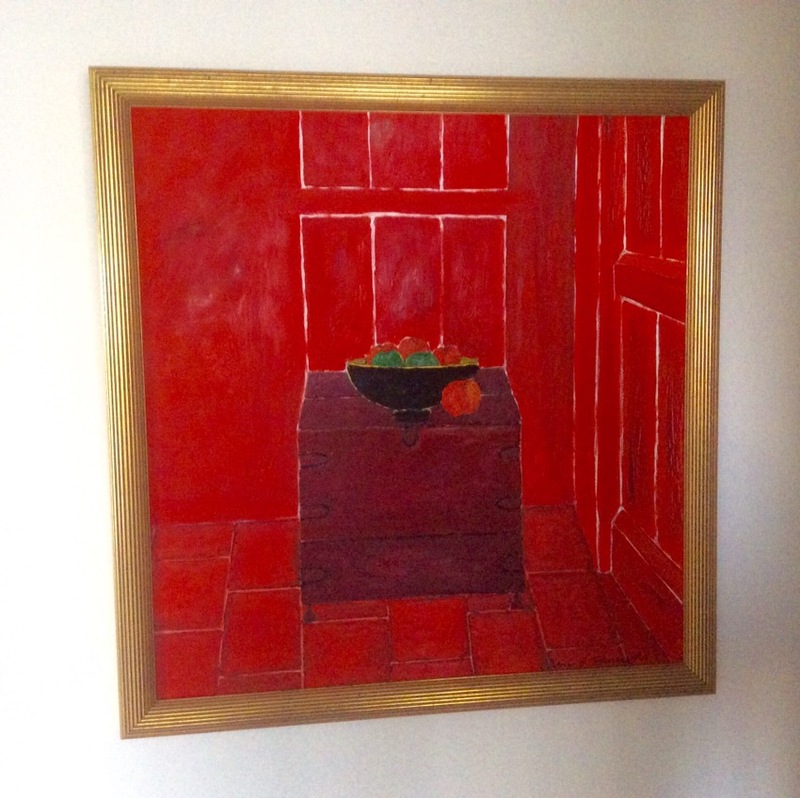 The first large piece, which was one of the pieces we bought when we first met John, hangs in our living room and the smaller, red still life, bought later, hangs outside our kitchen. 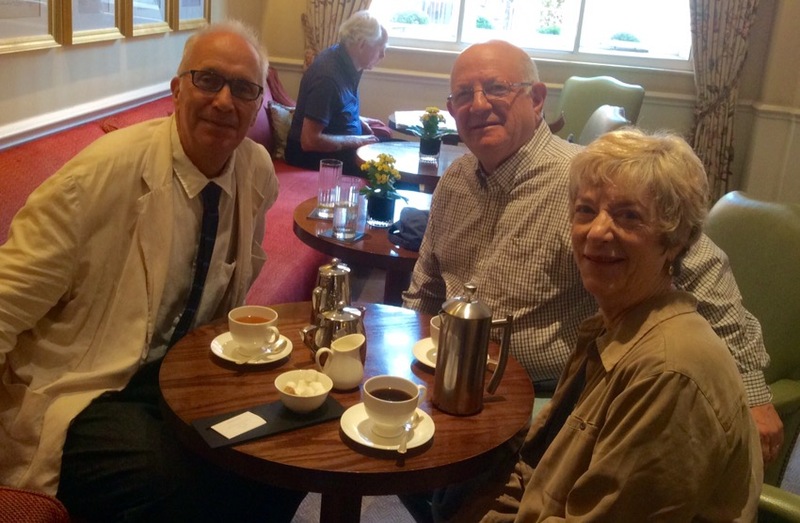 We had arranged to meet John at The Sloane Club at 11. 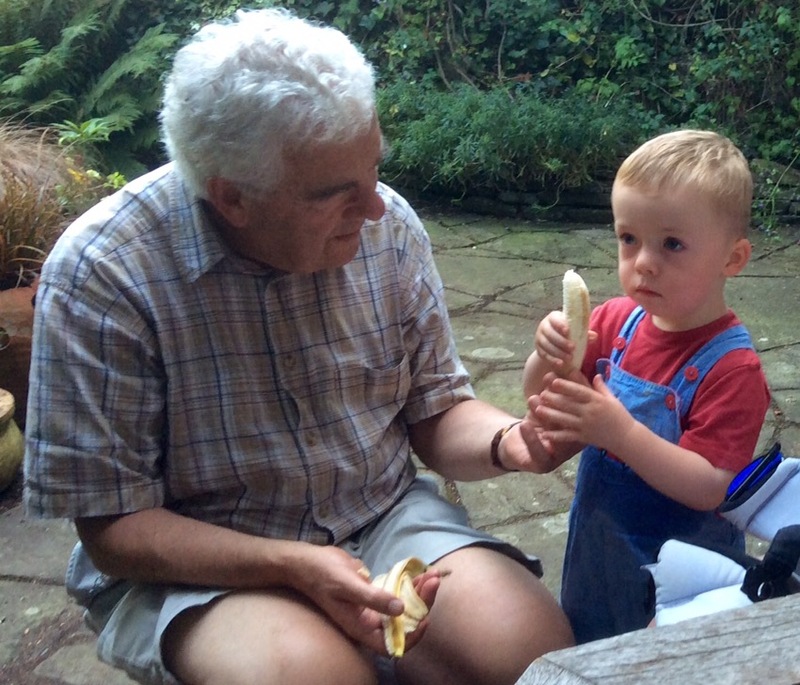 John has been through a lot since we first knew him, including a divorce and two quite serious bouts with cancer. While he, like we, looks 30 years older, as we began to talk, it was clear that his former spirit and sense of humor had survive in tack. For the first time in well over a decade John felt healthy. We talked about what he’d been through, which he wrote about in his book, How Cancer Saved My Life. He speaks widely on creativity and illness, is involved in public arts projects, such as murals, is a consultant to a large estate in LA regarding the valuation and sale of their art holdings and continues to paint himself, as he arises at 4 each morning. As our discussion ranged widely, first over coffee and then over lunch, we felt fully reconnected with John and his life. After about three hours, John needed to take off for a meeting with a publisher that will be doing the new book that he is working on. 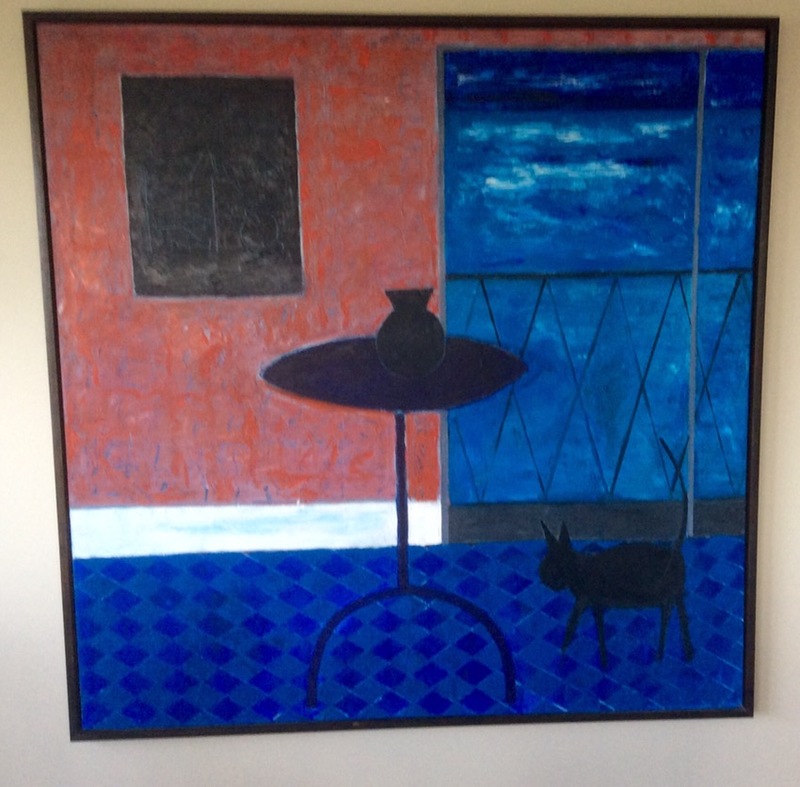 Oh, yes, and here’s a photo of the painting that John will be sending us when we return home. Carol and I took a short walk around the fashionable Sloane Square area in which we are staying, ducking into air conditioned stores to avoid the heat of the hottest September in London in more than a century. 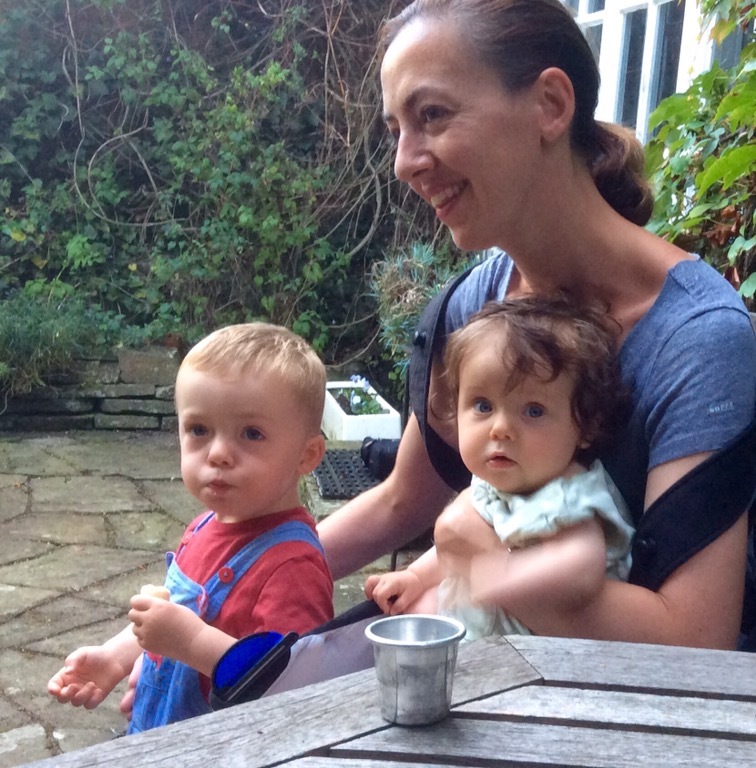 Returned briefly to the Club to change, and then set off by tubes and bus to Tom’s house, where we visited with Tom, his younger daughter, Sophie, an architect, and her two children, Lucas and Eva. Except when talking to us, Tom and Sophie spoke only Hungarian to each other and to the children. I’ve had some trouble deciphering/hearing English accents, but that pales by comparison to how I do with Hungarian. From Tom’s we took the tube, and got rather lost, going to visit Nick and Margaret Wilson in their flat in historic Lincoln’s Inn, which houses barrister offices, and some barristers. 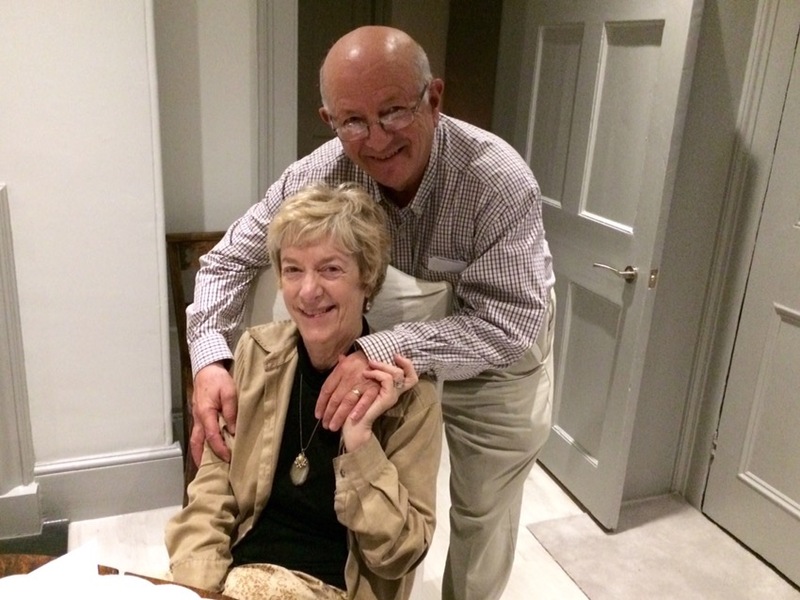 Nick and Margaret recently sold their house and are living in Lincoln’s Inn, where they will live until Nick retires at 75. Meanwhile, they are searching for a new house in the country, at which they will spend weekends and holidays. The Lincoln’s Inn building has no elevators, and there are 75 steps up to the Wilson’s flat. But we got even, because Nick had to come down to meet us when we got lost, and again to walk us to the tube station (at his insistence), when we left. Nicholas (Nick) Wilson, was the other Oxford graduate who taught legal writing at Northwestern, along with Andrew Walker. Because Nick did not share Andrew’s passion for music or bridge, and because he stayed in Chicago only six months, rather than a year, and because he is a good deal more reserved than Andrew, we did not get to know Nick as well as we knew Andrew. But we certainly did get to know and like him in Chicago. We saw some of Nick in 1967-68, and again on another visit to London in 1985, when we had a lovely dinner at their house and a rousing game of Trivial Pursuit afterwards. Our friend, Steve Sugarman has remained in much closer and more regular touch with Nick, so I’ve stayed up to date on Nick and his family, through Steve. Nicholas Allan Roy Wilson, Lord Wilson of Culworth PC (born 9 May 1945) is a British judge. 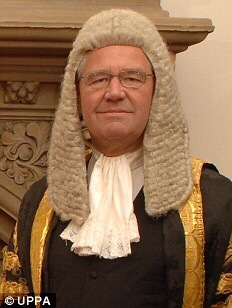 On 26 May 2011, he became a Justice of the Supreme Court of the United Kingdom, having previously served as a Lord Justice of Appeal since 2005. He was educated at Bryanston School and Worcester College, Oxford. Wilson was called to the Bar in 1967 (Inner Temple), and became a Queen’s Counsel in 1987. He was appointed a Recorder the same year. In 1993, he became a bencher and was appointed to the High Court, sitting in the Family Division, whereupon he was appointed a knight bachelor. He was appointed to the Court of Appeal in 2005, at which time he was also appointed to the Privy Council. On 26 May 2011, he joined the Supreme Court of the United Kingdom, succeeding Lord Saville of Newdigate and gaining the courtesy style “Lord Wilson of Culworth” for life. The original plan had been to go out to eat with the Wilson’s, but Nick emailed this morning that Margaret had decided to “knock up some supper,” so that we should just come up to their flat. 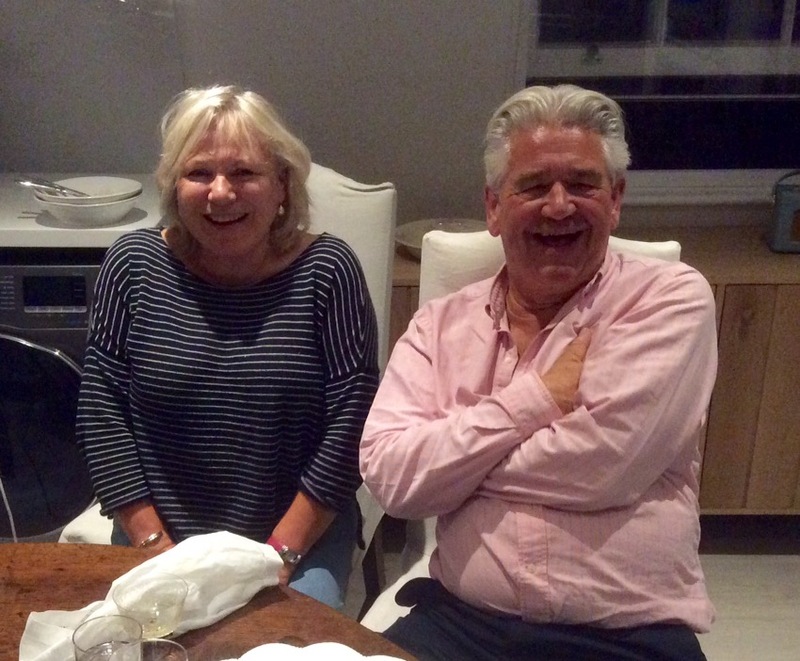 Amid drinks, and lively conversation that included a heavy dose of disbelief in Trump’s success and commentary about what an embarrassment he is to us, as well as similar discussions about Brexit, we ate the delicious dinner that Margaret had knocked up. We talked about my blog and, looking at yesterday’s post, Margaret immediately caught a misspelling of “chauffeured” in the title. I told her that I’d give her a shout out in this post, so here it is, Margaret. In all, it was a delightful three hours with Nick and Margaret, and we vowed not to wait so long for our next visit. Here is Nick in somewhat less casual garb. And here is a photo Margaret took of Carol and me. In walking us to the Temple tube stop, Nick gave us a bit of history about the buildings we passed. Back home, blogged and retired. Cubs shut out Cardinals, magic number down to one (don’t want you to think that I’m not on top of the important things). 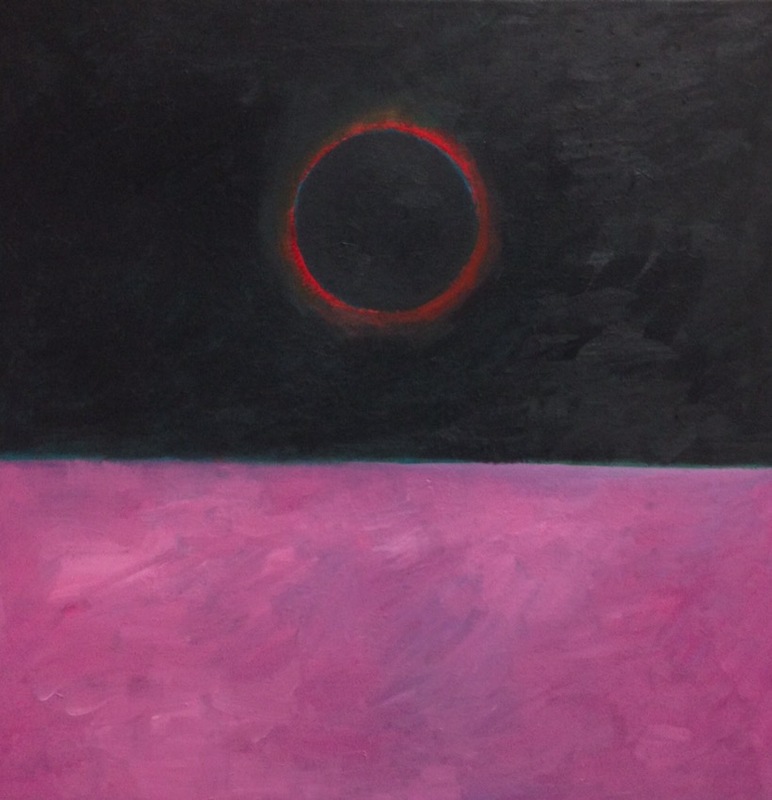 LOVE your new painting……..and the blogs, too. Loved reading this post and love all the pictures.